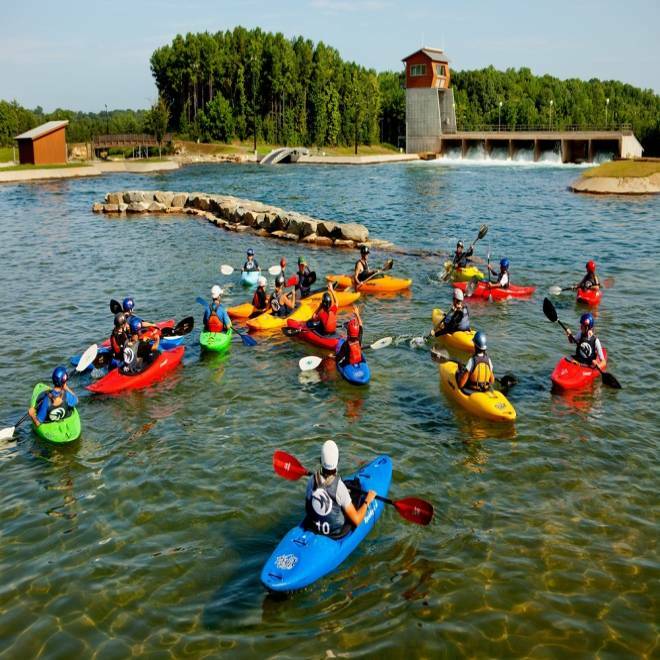 Summer campers participate in high adventure activities at the U.S. National Whitewater Center in Charlotte, N.C. Call it a special kind of wanderlust that comes over travelers every four years. Perhaps you’ll recognize the symptoms: Do you dream of leaping over hurdles? Going for the gold in a canoe? Are you experiencing a sudden craving for applause when you run? The Summer Olympic Games may have ended, but another form of Olympic fever has just begun for fans eager to learn some of the sports they saw performed so thrillingly in London. But no worries: You, too, can feel like an Olympian if you know where to go. Here is a sample of U.S. Olympic training sites where you can experience your favorite activities from the Games. Oklahoma City Boathouse Foundation, Okla.
Can’t make it to Yale or Harvard to take part in this elegant sport? Try Oklahoma City. The Oklahoma River was designated an official U.S. Olympic and Paralympic training site for rowing in 2009. 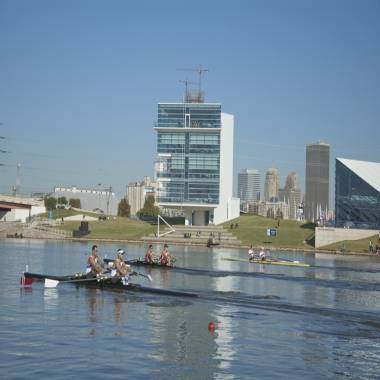 Experience Olympic-style rowing on the Oklahoma River, which is an official U.S. Olympic and Paralympic training site for rowing. “We always see additional interest following the Olympics – it brings the sports to life and people are very excited about getting involved,” said spokeswoman Elizabeth Laurent. The foundation offers lessons that will teach you the basics – like the difference between sculling (rowing with two oars) and sweeping (using one oar). You can practice your stroke – first, on an indoor rowing machine, then in an indoor rowing tank. Once you’re ready for more, there are classes that will have you gliding on the river. Lessons start at $85. To see rowing in action, check out the Oklahoma Regatta Festival, held Sept. 27-30. U.S. National Whitewater Center, Charlotte, N.C.
Home to the world’s largest, man-made whitewater river, this huge outdoor complex hosted the 2012 U.S. Olympic trials for canoe slalom in April. 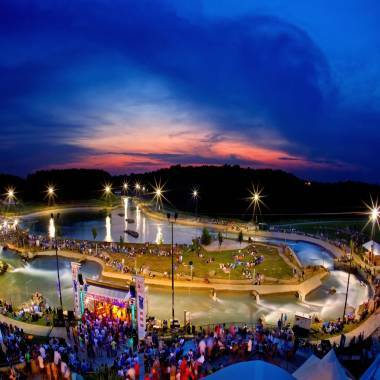 The U.S. National Whitewater Center has the world's largest, man-made whitewater river. For an intense and exhilarating ride, you can take lessons in whitewater kayaking that will have you speeding down turbulent rapids. “This is a great place to learn to kayak because we offer a controlled environment,” said spokesman Stephen Youngblade. Elite-level athletes train at the center in the spring and fall, he added. “The coolest factor is that we don’t change the water. The water that the Olympians train and compete on is the very same whitewater that the general public goes rafting in,” Youngblade said. For a more mellow outing, you can try flatwater kayaking in the Catawba River. The center will provide the gear -- no previous kayaking experience is required. A daily pass, which also includes rock climbing and zip lining, costs $54 for adults. Located about 60 miles north of Houston in the Sam Houston National Forest, the ranch serves as the USA Gymnastics National Team Training Center. Established by famed coaches Bela and Marta Karolyi, the ranch is closed to the general public when athletes train, but it does open its doors to Gabby Douglas-wannabes during the summer when it offers gymnastics camp. Female gymnasts of all levels who are 7 years and older may attend. Competitive experience in gymnastics is not necessary, and organizers say participants include beginners as well as elite competitors. Tuition starts at $435 for a six-day session. Manhattan Beach and Hermosa Beach, Calif. Enjoy the Southern California lifestyle and experience the sport where legendary beach volleyball duo Misty May-Treanor and Kerri Walsh Jennings – three-time Olympic gold medalists – practice their spikes and serves. Blessed with balmy weather and year-round sunshine, both communities offer plenty of places to learn: Manhattan Beach has some 50 beach volleyball courts, while Hermosa Beach has more than 70. If you’d rather watch other players in action, there are lots of tournaments to take in, including what officials call “the grand daddy of beach volleyball tournaments,” the Manhattan Beach Open -- held since 1960. Which Olympic sport would you like to try? Tell us about it on Facebook.